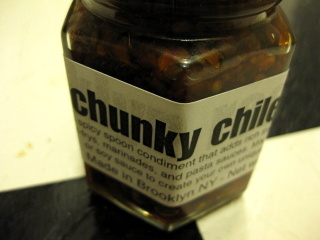 chunky chile oil - Your new favorite condiment. 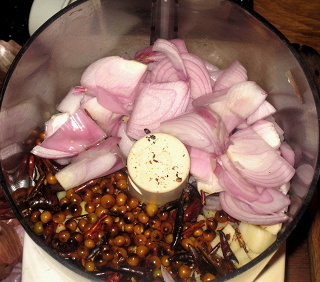 I start with a mix of chiltepin and de arbol chiles, organically grown on my Boerum Hill Brooklyn rooftop. As supplies dwindle of the de arbols, which I only grew a few of this year, I'm supplementing with store-bought de arbols and anchos. 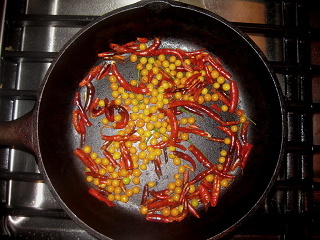 The dry chiles are toasted in a dry frying pan for a few minutes to wake up the flavors and add a bit of char. 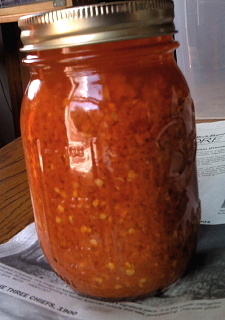 The toasted chiles are mixed with shallots, garlic, scallion, ginger, and salt and blended into a chunky paste. I heat non-GMO canola oil until very hot, then pour in the chunky chile mixture. The heat of the oil draws intense flavors out of the ingredients, and I saute them for only a few minutes to keep the flavor very bright and fresh. By varying the proportion of chiles I can make both hot and mild versions. Chunky chile oil has a bright rich flavor, the hot version has a fierce heat that fades quickly. Chunky chile oil is excellent as a sandwich spread, a dipping oil, for stir-fries, meats, and any dish that needs a bit more flavor. For retail distribution chunky chile oil is packaged two ways: the default is a cute little 4oz jar suitable for gift-giving. There is also a recession-era style of packaging using recycled, cleaned, and re-labeled babyfood jars which will save you a couple bucks per jar. Contact me via e-mail for pricing information. Mail order is available.